As you may have learned if you've read my blog for awhile, on occasion, once in awhile, maybe once in a blue moon, I overcommit to too many projects or activities. I'm a born multi-tasker, however with work, moving and unpacking, and all the weekend workshops I've been taking, perhaps I should slow down on signing up for additional workshops or classes online, right?!? I just couldn't pass up another Hope Wallace-Karney class. Although I have signed up for all of her journaling classes and haven't found too much time to work on them, I signed up ANYWAY! She is teaming up with her good friend Kari Ramstrom for this class. 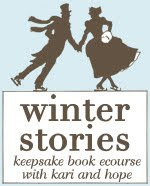 It is called WINTER STORIES. I am looking forward to working on this journal, and the other class I'm taking is Shimmel's Journaling my Christmas class. The journal I purchased from one of my favorite shops for paper journaling items, Every Jot and Tittle. I also had purchased a cute valentiney mini book from her too. Looking forward to working on my Holiday Manifesto's tonight and catch up with the last couple days!! One of my favorite scrapbooks that I created when I use to scrapbook EVERYTHING, is my Christmas Albums. I have the few pictures we still have from our childhood in one and probably 4 or 5 years worth of the late 90's early 00's in one. I think it's fun to see year over year how people change, what fun things you do each year, and how many things remain the same. What holiday memory recording will all of you be doing?? I bought a kit for a Christmas Journal from Stephanie Ackerman - a sort of count down to Christmas. I would love to take one of Hope's Journal classes and can't wait to see yours when you are finished. I love, love the vintage buttons on the top album cover! i'm still working on my holiday albums from two years ago. how did pushing something off for one week turn into two years!? Everything looks so cute. Love your wonderful journal. Merry Christmas! I adore Hope, and I have loved the online classes I have taken from her! Merry Christmas!!! !